Join us on Saturday, June 8, 2019 from 9:30 to 11:30 am at The Cafe for a morning with Spiritual Medium - Marianne Michaels. Marianne helps people connect with loved ones and animal companions who have passed. 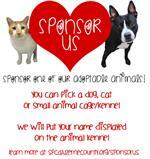 Sponsor One of Our Adoptable Animals cage/kennel.